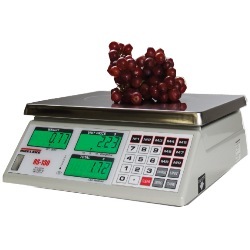 Very few NTEP legal for trade retail price computing scales on the market can boast all the features of the Rice Lake RS-160 certified produce market scale. The RS 160 retail scale is NTEP legal for trade and what sets this scale apart is the fact that it displays weight not just in pounds but also in kilograms and in ounces. The scale can also calculate customer change. The RS-160 from Rice Lake is ideal for a farmers market or weighing larger objects like watermelons or pumpkins. The scale can operate on standard AC power or the built in rechargeable battery which features 100+ hour use before recharge. The Rice Lake RS160 retail scale is the ultimate solution for price computing applications. This scale provides you with convenience and accuracy in one compact digital scale. The RS-160 can save eight direct price lookups and 89 indirect price lookups. Quickly calculate cash back for applications where a cash register is not present. The large 12" x 9.5" stainless steel platter provides ample room for product and a standard in-use cover assures years of trouble free operation and an extra layer of protection from light spills. The RS-160 is NTEP-certified and operates on a rechargeable battery (included). A low battery annunciator signals the operator when it's time to recharge. Overall the Rice Lake RS-160 provides accurate and affordable solutions for simple price computing applications.